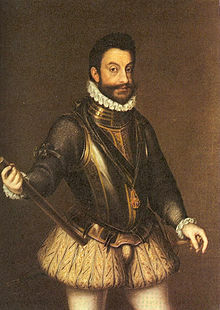 Emmanuel Philibert (in Italian: Emanuele Filiberto or Testa di ferro, Piedmontese: Testa 'd fer, "Ironhead", because of his military career; 8 July 1528 – 30 August 1580) was Duke of Savoy from 1553 to 1580, KG. He is remembered for the Italianization of the House of Savoy, as he recovered the savoyard state (invaded and occupied by France when he was a child) following the Battle of St. Quentin (1557) and subsequently moved the capital to Turin and made Italian the official language in Piedmont. Born in Chambéry, Emmanuel Philibert was the only child of Charles III, Duke of Savoy, and Beatrice of Portugal to reach adulthood. His mother was sister-in-law to Charles V, Holy Roman Emperor, and the future duke served in Charles's army during the war against Francis I of France, distinguishing himself by capturing Hesdin in July 1553. A month later, he became Duke of Savoy on the death of his father, but this was a nearly empty honour, as the vast majority of his hereditary lands had been occupied and administered by the French since 1536. Instead, he continued to serve the Habsburgs in hopes of recovering his lands, and served his cousin Philip II of Spain as Governor of the Netherlands from 1555 to 1559. In this capacity he personally led the Spanish invasion of northern France and won a brilliant victory at Saint-Quentin on 10 August 1557. He was also a suitor to Lady Elizabeth Tudor, daughter of Henry VIII of England. With the Peace of Cateau Cambrésis between France and Spain signed in 1559, the duchy was restored to Emmanuel Philibert and he married his first cousin once removed, Margaret of France, Duchess of Berry, the sister of King Henry II of France. Their only child was Charles Emmanuel I of Savoy. Following the death of his uncle, Henry I of Portugal, on 31 January 1580, Emmanuel Philibert fought to impose his rights as a claimant to the Portuguese throne. However, he soon realised that he had quite a fragile position due to the claims of Philip II, who gained control of the country, thus uniting Spain and Portugal. Emmanuel Philibert spent his rule regaining what had been lost in the costly wars with France. A skilled political strategist, he took advantage of various squabbles in Europe to slowly regain territory from both the French and the Spanish, including the city of Turin. He also purchased two territories. Internally, he moved the capital of the duchy from Chambéry to Turin and replaced Latin as the duchy's official language with Italian. He was attempting to acquire the marquisate of Saluzzo when he died in Turin. Later, he was buried in the Chapel of the Holy Shroud of the Turin Cathedral, to which he had moved the Sindone in 1578. ^ Kamen 1997, p. 64. ^ Kamen 1997, p. 67. ^ Kamen 1997, p. 73-74. ^ Leathes, Prothero & Ward 1964, p. 399-400. Kamen, Henry (1997). Philip of Spain. Yale University Press. Leathes, Stanley; Prothero, G. W.; Ward, Sir Adolphus William, eds. (1964). Cambridge Modern History. 1. Cambridge University Press. Wikimedia Commons has media related to Emmanuel Philibert, Duke of Savoy. This page was last edited on 22 January 2019, at 03:31 (UTC).